You can edit any text or binary file directly in PowerGREP, just like you would in a text editor or a hexadecimal editor. PowerGREP's editor has all the features you'd expect: word wrapping, line numbering, syntax highlighting, block editing, unlimited undo, etc. The key benefit of using PowerGREP's built-in editor is that you can easily inspect the full context of each highlighted search match. Click the Next Match and Previous Match buttons to quickly navigate through all matches in the file. Match highlighting persists even when you edit the file. After previewing or executing a search-and-replace action, you can conveniently replace or revert individual matches. Simply click on the match, and then click the Replace or Revert button in the editor. To replace just a few of the search matches, preview the action and then replace individual matches. To replace most search matches, execute the action (which replaces all matches), and then revert those individual matches that you didn't want to replace. Of course, you can also replace or revert all matches in a file with just one click. PowerGREP's method of replacing and reverting individual matches is far more intuitive than the way most Windows search-and-replace tools work. The typical Windows grep tool forces you to answer a Yes/No question popping up for each search match, in the order that matches are found. PowerGREP gives you the opportunity to replace and revert matches in any order, whenever you want, with full editing access to the file. If you save the results into a PowerGREP Results file, you can open the results days or weeks later, and still see each match highlighted. You'll still be able to replace or revert individual matches, if your earlier decisions didn't turn out too well. 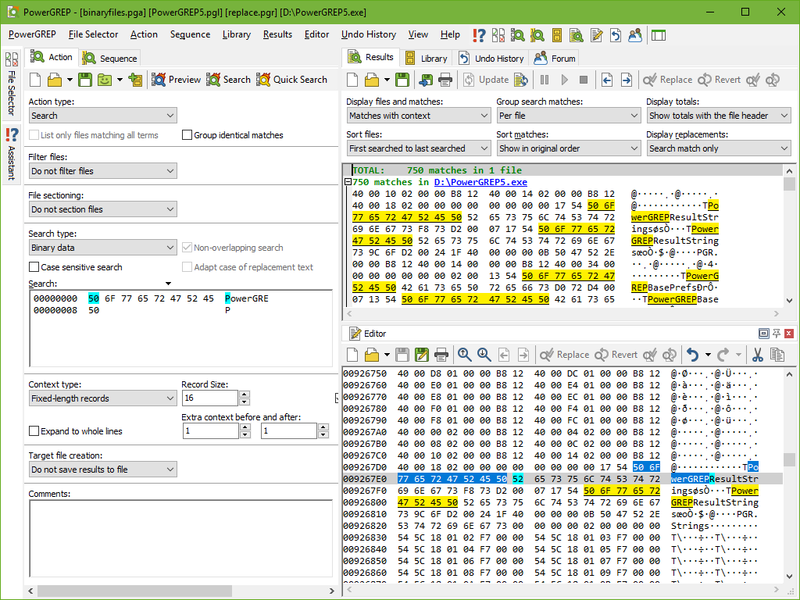 The screen shots show the Editor panel docked side-by-side with other parts of PowerGREP. You can rearrange the panels to make the editor take up the full screen or drag it off to a second monitor to maximize your editing space. PowerGREP's built-in converters for MS Word DOCX files and OpenOffice and LibreOffice ODT files allow you to edit these files in PowerGREP's built-in editor. In the File Selector, make sure "file formats to convert to plain text" is set to "writable proprietary formats" or "all writeable formats". Even though PowerGREP's editor doesn't show you any formatting, all formatting is be preserved when you save the edited file. 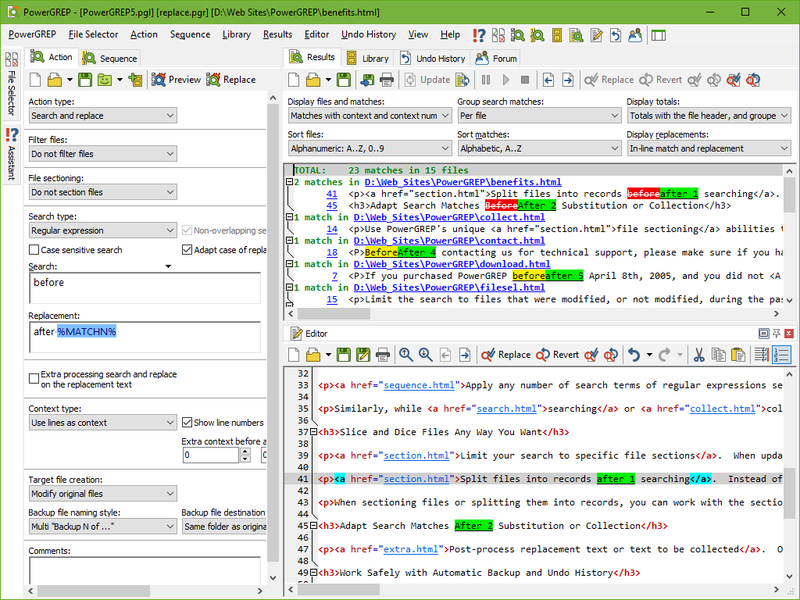 PowerGREP's editor allows you to edit the raw contents of HTML and RTF files, showing you the HTML tags and RTF codes with syntax coloring, just like modern text editors do. But if you select "all writeable formats" in the File Selector, then PowerGREP's editor shows you a pure text conversion when you open an HTML or RTF file. This pure text conversion is fully editable. PowerGREP will preserve the HTML tags or RTF codes when you save the edited file. This way of working is great when you want to focus on the actual content of the files. You can instantly open any file in its default application, by right-clicking on it in PowerGREP. You can also configure any number of external editors for opening files of specific types, or any kind of file.